For 56-year old Yohana Isaya, a farmer from Ndurungumi village in Kongwa District, central Tanzania, maize farming was always a losing game: a stressful, but extremely important subsistence venture. He has to do something or how else would he feed his family? 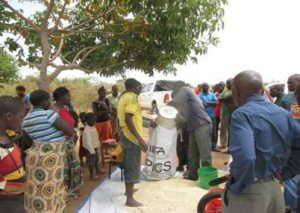 To begin with, shelling the maize harvest from his 5-acre plot was a back-breaking job which he, together with his wife and their five children couldn’t do on their own. They needed the help of at least eight extra pairs of hands to finish the job in three days. Isaya would then use the traditional “Kilindo”, a small cylindrical traditional bin made from peeled miombo tree barks, to store his maize to be used sparingly for feeding his family. Most of the time, nearly half the stored maize would be moldy and inedible. What he didn’t know then was that there was a better way. There were new and efficient postharvest technologies developed by IITA’s AfricaRISING Project that could change the zero sum game that maize farming and storage had become to a winning one. “Before joining the Africa RISING-NAFAKA-TUBORESHE CHAKULA scaling project activities and training, I was using a raised wood platform for shelling maize. Usually it took me up to three days to shell 700 kilograms. We sometimes had to ask for help from our neighbors whom we’d have to compensate by providing food, local brew, and sometimes cash. But, after the project trained us on using simple and affordable machines like the motorized maize sheller, the same kind of work now takes only 30 minutes,” explained Yohana. But it is not only the maize shelling machines that the farmers have been introduced to. The postharvest training have also focused on a complete package of technologies including collapsible drier cases capable of drying 400 kg maize in five hours in the sun, and storage using hermetic bags. As a result, farmers have been able to reduce the amount of time spent on crop processing, reduced food losses, and improved food security in their households. The Africa RISING-NAFAKA-TUBORESHE CHAKULA scaling project aims to scale the use of postharvest technologies among 47,000 Tanzanian smallholder farmers. Recent studies in the semi-arid areas of northern and central Tanzania have shown that 20−40% of grains and legumes are usually lost during harvesting; a further 5% is lost during shelling−even when the amount of grains shelled per day was very small due to drudgery and the lack of improved shelling technologies; a further 15−25% is lost during storage. Practices like drying crops on the bare floor also often lead to contamination and storage when the moisture content is high leading to deterioration. These challenges are what drove the project to introduce postharvest technologies to the Tanzanian farmers.